Diurnal raptors of Australia: eagles, falcons etc. Recent taxonomy, based on DNA analysis, has separated the falcons, kestrels and hobbies from the other raptors, regarding them as more closely related to songbirds and parrots. Australia’s largest eagle is the wedge-tailed eagle, usually slightly larger than America’s bald eagle but not quite as heavy. and found throughout Australia and in New Guinea. Seeing them thermal high in the sky you may not always appreciate their size, but if you round a corner and come across one feeding on carrion by the roadside you will see how impressive they are. They are one of two eagles with wedge-shaped tails, but the other is the sea-eagle, the adults of which are mostly white below and not found so far inland. The wedge-tail nest is an enormous structure of twigs, often used and added to for a number of years. Please do not approach closely – despite their size, like some other raptors they tend to be nervous and may spend too long away from eggs or chicks if they see you. As its name suggests, this majestic bird is most often seen along the coasts, although also along some rivers, large creeks and lakes, but is absent from most of the outback. It feeds on fish, turtles and waterbirds (even as large as ducks), and although slightly smaller than the wedge-tail it has larger talons. The tail is wedge-shaped, and the brown juveniles may at first sight be confused with the wedge-tailed eagle, but their heads are still paler. Another bird seen along the coasts, mainly in tropical and subtropics regions, and especially around mangroves and estuaries, this beautiful kite is quite unmistakable as an adult with its white head and red-brown body. Like our saltwater crocodile, this species is found from Australia through southeast Asia to India. In India it is considered sacred, and (similar to the Brahmin cattle you will see in northern Australia) is named after the Brahmin caste. 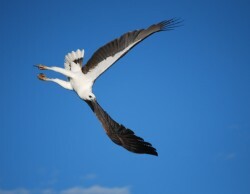 One of the most common kites, which you may see diving for fish on an offshore island or circling overhead far into the outback. It can be confused with the little eagle – check a good bird book for the essential differences (they can be subtle, and this page does not pretend to be an identification guide). The call however is unmistakable once you’ve heard it – a series of short whistles followed by a more drawn-out one. Another very common kite, often seen perched on telegraph wires or hovering above crops and grassland looing for rodents to swoop on. They are an attractive bird, found throughout most of Australia and very similar to related species of other continents. They are also rather similar to the far rarer ether-wing kite of the outback (and the letter-wing is unusual in doing much of its hunting by night). Its silver-grey wings are very attractive as it hovers with sunlight shining through them. These used to be called fork-tailed kites, and one of their most distinctive features (apart from being dark) is the fork-shaped tail. 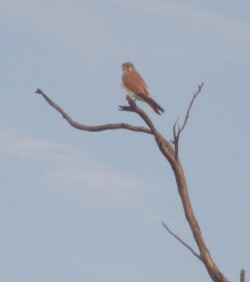 They are one of the most common raptors in the outback but can be seen in some coastal areas as well. These are rather delicate looking raptors with barred breasts that used to be called crested hawks, as they have a distinctive crest on the head, but the name was changed to be in keeping with related bazas in Asia, Africa and Madagascar (this is the only species in Australia). Unlike most raptors, it often feeds on insects, lizards and tree frogs in the canopy, and sometimes even fruit. There are a number of other eagles, hawks, goshawks, kites and harriers in Australia – and there are several excellent bird books that can help you identify them. This is our smallest diurnal raptor (and one of the world’s smallest), and very common throughout the country (as well as New Guinea) in many kinds of open habitat. It is usually seen perched on a high vantage point such as sea branches or telegraph poles watching for prey, or hovering above crops and grasslands ready to stoop on insects and very small vertebrates. They are sometimes seen to harass our largest raptor – the wedge tailed eagle – if they have a nest nearby, being better able to perform quick changes of direction in the air than the much larger bird. The name ‘nankeen’ comes from the red-brown colour of earth in the Nankeen district of China. The Peregrine is found in all continents except Antarctica. There are two subspecies in Australia, one in the southwest corner of the continent and one throughout the rest of the country.